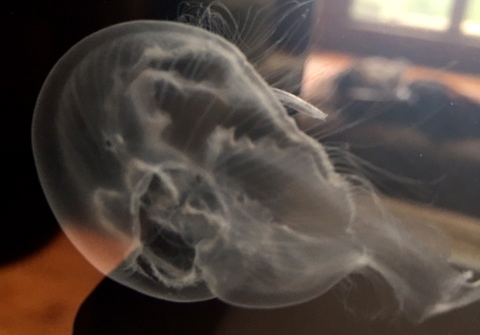 Do your jellyfish look like this? 1. Improper filtration and/or incomplete cycling of your filters. 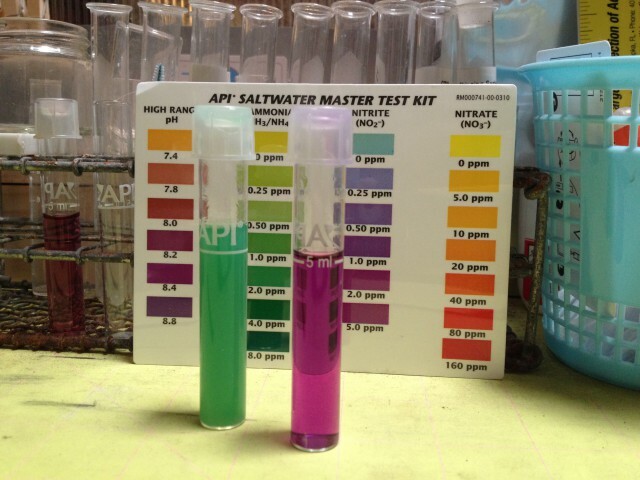 If you haven’t properly cycled your tank, then you most likely have toxic levels of ammonia and/or nitrite in your water. This can happen when you initially set up an aquarium and add jellyfish (or any life forms, for that matter…this is not a jellyfish specific issue, but a standard fish or coral tank issue. You must take the time to properly cycle your aquarium no matter what animals you choose to keep in it). 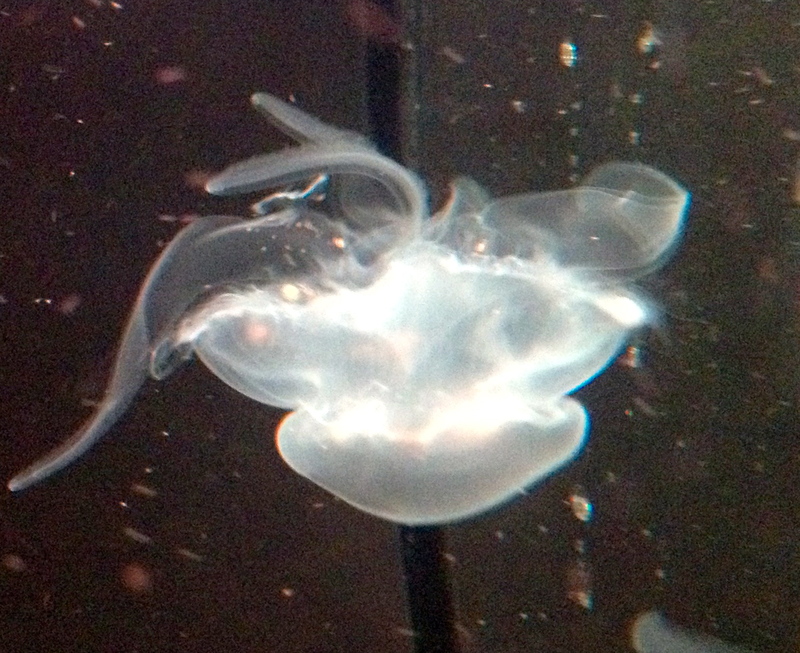 Once jellyfish are added to the tank, they begin to produce ammonia. Once ammonia starts to build up, you need to have a way to eliminate it. This is why proper filtration is important. A properly filtered aquarium will have a biological filter in place, which will remove the toxic ammonia and nitrite by way of the beneficial bacteria that populate the filter media (i.e. bio balls). If you do not have beneficial bacteria actively removing the ammonia and nitrite, then the water becomes toxic and the jellyfish will soon begin (within 2 days) to disintegrate like the pictures demonstrate. Ammonia & Nitrite levels demonstrating the middle of a nitrification cycle. This is a very toxic situation. Jellyfish will fall apart if subjected to these levels of toxicity. Why are you having an ammonia spike even after you’ve already cycled your tank? An ammonia spike can occur if you stopped feeding your tank for any reason. Sometimes folks let the aquarium go down, or let it run without any animals in it for awhile like if they go on vacation or take some time away from keeping jellyfish, or they don’t have jellies in it for several days for whatever reason. This leads to an ammonia spike because your beneficial bacteria in you filter box didn’t receive any ammonia to eat—your system wasn’t creating any ammonia because you had no jellyfish in it & subsequently weren’t feeding any jellyfish. This means the beneficial bacteria went with out food (ammonia) and starved to death. So, if you then add jellyfish to the tank when you get back from vacation (or whatever), there is no beneficial bacteria available in the filter box to eliminate the toxic ammonia & you experience an ammonia spike and shredded jellyfish as the pictures show. If you do go on vacation, or take more than 3 days away from having jellyfish in your tank, you can alway place a small, 1/4″ piece of raw fish or shrimp in the filter box to continue to decompose and create ammonia for the beneficial bacteria to feed on while you’re away. When you return, always take an ammonia reading and remove the piece of raw fish or shrimp before adding new jellyfish to the tank. Make sure your ammonia and nitrite levels are at zero before acclimating any new jellyfish into your tank. An ammonia spike can also happen if you interrupted the cycling process by cleaning the tank, changing any mechanical or chemical filters, or conducted any water changes prior to the tank completely finishing its cycling process. Do not interrupt the cycling process. I know it’s tempting to want to get the sides & bottom of the tank clean. The algae growth can be unsightly, but remember, you are creating a living environment from a static one. Life can be messy! Let nature take it’s course and be patient– I know it’s hard, but it is necessary. You can clean the tank all you want after the cycling process is over! If you interrupt the cycle, it can take almost 3 times as long to get it back on track an in a non-toxic state. Be patient. It’s worth the wait! You are receiving jellyfish that are coming from a pristine environment. When you receive a shipment of jellyfish, the water quality parameters are most likely different from yours. You must take the time to acclimate the jellyfish in the shipping bag to the temperature of your system. After 10-15 minutes of floating the bag so the temperatures equalize between the bag and your tank water, acclimate them to your water quality (pH, salinity), by conducting small water changes in the bag over 45 minutes to 1 hour. Don’t take all night doing this step. The jellies need to get out of the bag and into a moving environment. Acclimation shouldn’t take more than 1.5 hours from start to finish. If it is taking longer than that, then there is another problem at hand that needs to be addressed. If you are making up your saltwater with tap water, your jellyfish will fall apart. Tap water has heavy metals in it that the jellyfish cannot tolerate. You must make up your saltwater with RO, RO/DI, or distilled water for it to be safe for jellyfish, much like a reef tank. Do not use metal utensils or tools with your saltwater jellyfish aquarium. Only use plastic tools. Always wash your hands before dealing with your jellyfish or handling the jellyfish food. Zinc, brass, lead & petroleum products (sometimes found in soaps and lotions) will add heavy metals to your system. The jellyfish will fall apart if you introduce them into the water. Also, I should mention that aquarium heaters can get old– moreover, their seals can get old and crack. This can allow water to leak into them where the metal heating coil is located and other metal parts. If you have an old heater, check it for any visual signs of rust on the heating coil. If you see rust, throw it away and purchase a new one. Send us your problem jellyfish pictures and we’ll diagnose the problem and tell you how to fix it. We’ll also write a new blog post about it so we can inform and help others that may be experiencing the same problem! Have you had an unusually long cycling process? Are your new jellyfish shrinking fast even after the tank finally cycled?? Please read our blog post next week for answers. Next Sad Jellyfish Even After Finally Cycling your Tank? Hi Donna, Sorry to hear you are having some trouble with a few of your jellies. Please see our blog post, When your jellyfish takes a personal day for more info on how to handle such a situation when some jellies are doing good, while others are not. Also, the biggest problem we see that folks are having with keeping jellyfish doesn’t have anything to do with jellyfish specifically, but with an un-cycled aquarium. You must cycle your aquarium, no matter how big or small, before adding live animals of any kind…jellyfish, fish, anything you want to live. Please see our blog post about our Fish-less Cycling Program and sign up! When you successfully finish it, we reward you with 3 free small jellyfish with your first purchase of jellyfish! How long does the cycling process usually take with store bought ready-mixed water ? The cycling process takes about 4-6 weeks. Take a look at this FAQ from our website: http://www.sunsetmarinelab.com/jellyfish-faq/#cycle.